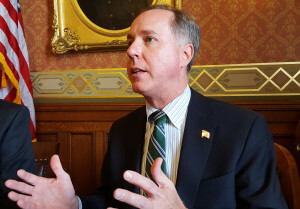 Assembly Speaker Robin Vos is responding to a report that he swore at Ohio Governor John Kasich and accused him of betraying the Republican Party over his support for a lawsuit challenging Wisconsin’s legislative redistricting. Kasich said in a New York Magazine article that Vos confronted him this fall during a meeting in Ohio, and criticized him for signing on to a legal brief in a case currently before the U.S. Supreme Court. The challenge claims that Wisconsin’s 2011 redistricting amounts to an unconstitutional gerrymander.